The Social Media Poster gives you an interactive calendar in which you can plan out the entire year for your Twitter, Pinterest, Instagram business, Facebook business, and Linkedin company pages. Set the dates and times of your posts, make drafts, and create a queue so you always have content ready to share with your audience. One of the trickiest parts of running any social media campaign is being able to maintain an organized and optimized schedule of posts. With social media being such a fast moving platform it is important to have an idea of what you’re going to post not just now, but also a couple of weeks down the road. You can switch your calendar view between month and timeline (weekly). Change this by selecting the drop-down menu in the top left of your calendar. Every hour view is as simple as it sounds, each day will be broken down by the hour. The smart view is slightly different. With Smart view, the amount of time within these blocks is determined by the number of goals you have set for your profiles. Goals are essentially the number of times you wish to post from your profiles per day. These can be changed in your settings, under profiles and queue. By default, the smart view will block your calendar into 4-hour windows because the default goal settings are 4. However, when you change the number of your goals you will also change the length of these time blocks. If the number of goals is lower the time frame will increase when the number of goals raises the time frame shortens. Which view you choose is one hundred percent up to you and ultimately comes down to what your own goals and strategies are when it comes to social media. There are a number of different ways you can schedule a post on your calendar. You can simply click on the specific day of the calendar you wish to post and choose between the different time blocks in each day. Once you click the day and time you want to have the post you will be brought to the preview page of your new post where you will actually be able to create the content of the tweet or post and select the exact time you want the post to go live. This same process can be done by clicking the new post button at the top of the calendar. Your post will automatically be posted on that day unless you change the scheduled settings in the preview screen. Posting your Instagram post works a little bit different because it only works for Instagram Business accounts and cannot directly post from SEMrush onto a feed (due to Instagram’s API). Posting on Instagram allows you to only have 1 image within your post. This excludes things such as gifs or slideshows. 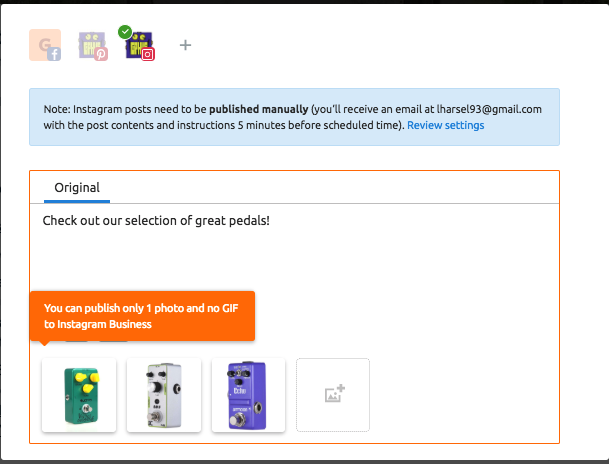 When the scheduled time of your post comes, the Social Media Poster will email you a notification with the contents of your planned post. Then all you have to do is download the text and images and upload them to IG. 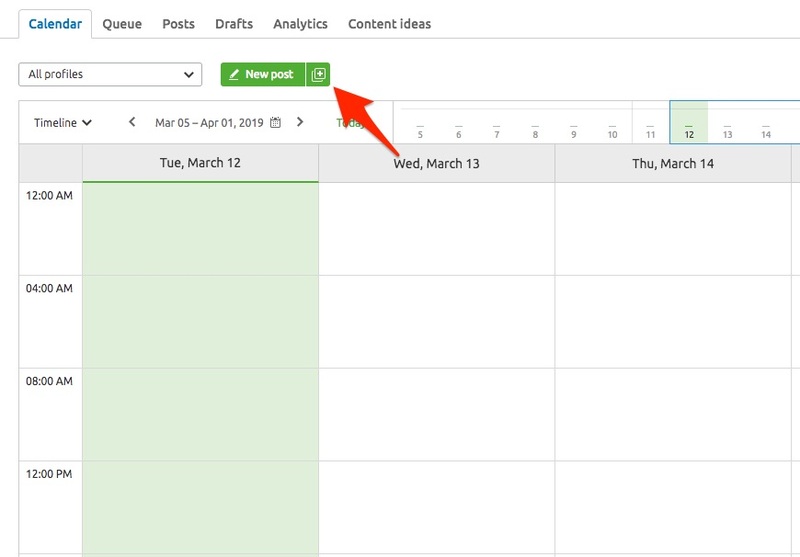 If you already have a fully planned out campaign in a spreadsheet and want to quickly upload all of your posts at once, you can do that with the Bulk Scheduling feature. Directly the right of the green new post button will be the bulk scheduling button. This will instruct you on what kind of table you will need. The only required column is for your content, this will be what text you want in your posts. The other three columns are recommended but optional. These include date, time and which social media channel you want to post on (Facebook, Twitter, LinkedIn, Instagram, Pinterest). The final way to create a post is to use the keyboard shortcut “N.” This will immediately prompt you to the preview window. To find out all of the keyboard shortcuts you can view them in the settings section in the top right. You can include emoticons to help increase the creativity of your posts which can lead to more engagement with your audience. To add them simply click on the smiley face at the bottom of your posts. Not only can you add emoticons but you can add animated GIFs as well. This can be done manually through the GIF button or by choosing to add them through giphy. After deciding what to do with your drafted post you can view your future post by selecting on a later date with the date range drop-down menu. This can be perfect in letting you know what type of content you have down the line so that you can synchronize your other campaigns to match. This can also be helpful in making sure you are not posting any duplicate content to your social sites. If you are running multiple social media campaigns, the social media poster lets you plan out these posts for all of your campaigns at once. You can schedule posts on Twitter, Pinterest Facebook (business), Instagram (business) and LinkedIn all on the same calendar.